Northeast prototype 'Subsurfer' promises to be a Chesapeake Bay watershed solution. Surface-applied dry dairy manure and poultry litter are environmentally problematic particularly in the Chesapeake Bay watershed. The nutrients are prone to run-off, especially in no-till fields. That may be changing though. Over the last three years, Penn State and University of Maryland research on subsurface poultry litter applications found at least a 30-bushel per acre yield advantage compared to surface-applied litter. 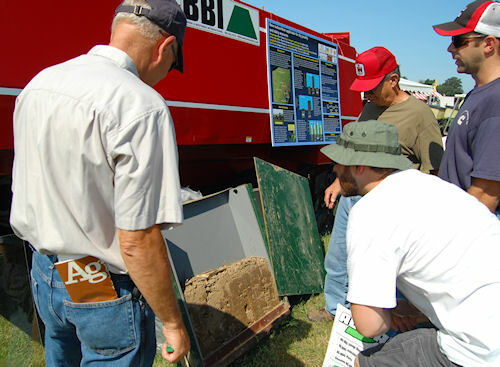 "Subsurface applications of litter reflect much greater nutrient efficiency," confirms Penn State Agronomist Doug Beegle. COMPOSITE TOOL: The Subsurfer is built on a BBI spreader frame and a hopper with augers on the floor. No-till planter components place manure under crop residues. That led USDA's Agricultural Research Service scientists to design a no-till applicator built by Barron & Brothers, International, of Cornelia, Ga. With further refinement, more of the aptly named "Subsurfer" tools are being built for on-farm research by Cornell, Penn State, University of Delaware, University of Maryland and Virginia Tech. But the once-revised model (shown here) belongs to University of Maryland Eastern Shore research team, to be shared with University of Delaware. A total of five of the machines will be field-tested in Delaware, Maryland, New York, Pennsylvania and Virginia's Shenandoah Valley. The Subsurfer is expected to get its second showing at the Precision Ag Machinery Day, on Tuesday at Denton, Md. The pictured model, built on BBI's Endurance spreader tandem-wheel running gear, was built for demonstrations and transport, says Beegle. Commercial models, if and when they become available, are likely to be larger. Hopper capacities on the Endurance spreaders range from 160 to 658 cubic feet. CORN YIELD BOOSTER? The potential of 30-bushel no-till yield increases and improved nutrient efficiency is a farmer eye-catcher. The hopper was redesigned with screw augers in the bed instead of a conveyor chain. And the augers had to be enlarged to prevent bridging of the dry materials. Powered by hydraulics, the machine can inject materials via variable-rate technology. 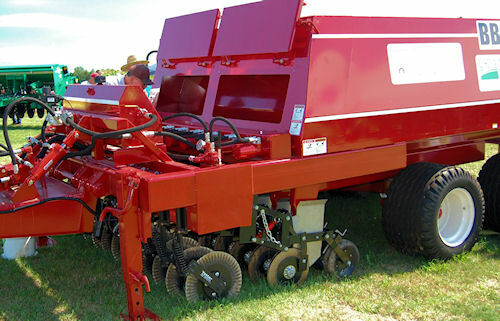 Dry manure materials are fed into the front-mounted planter disk openers following no-till coulters. Shields were added to keep the materials from blowing away. Planter closing wheels seal in the manure/litter.